Even when including Google's own Android platform into the mix, Apple Maps has had a devastating impact on Google Maps. One year ago, Arthur stated, citing comScore data, 81.1 million were using Google for mapping out of a total population of 103.6 Android and iOS users. The latest September data shows that just 58.7 million are still using Google's product, despite the total installed base having grown significantly to 136.7 million. That's a shift from over 78 percent of all Android and iOS mobile users on Google Maps to just short of 43 percent in one year. On iOS, 35 million users pulled up Apple Maps in the month, out of a total population of 60.1 million users: more than 58 percent. Arthur stated that iOS users accessing Google Maps fell from a peak of 35 million last September to around 6.3 million today, a decrease of more than 80 percent of Google's users. Data from comScore indicates Apple's users interact with Maps more often (9.7 million iOS users access Maps each day, compared to just 7.2 million for Android) and spend more time in mapping apps: 75.5 minutes per month on average, compared to 56.2 on Android. 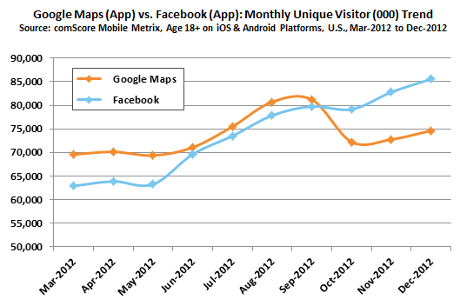 Another factor both map services face: younger people statistically make less use of mobile map apps. 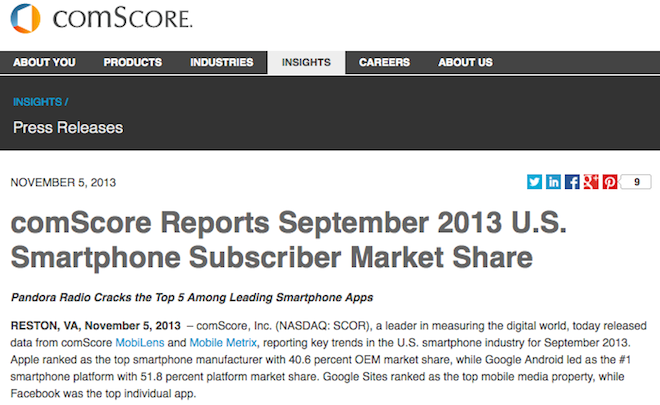 On top of that, comScore indicates that the release of iOS 6 last year effectively helped to erase six months of Google's user growth, despite incessant complaints about flaws in Apple's 1.0 release, some of which continue to persist one year later. Apple is working to improve its maps product, having acquired a number of startups related to transit directions (including Locationary, HopStop, and Embark) and interior mapping with WiFiSLAM, dovetailing with the company's own iBeacons microlocation technology. It has also worked to deliver 3D Flyover as a compelling visualization for both iOS mobile users and desktop Mac users, with the release Maps for OS X Mavericks and system-wide integration with Data Detectors. Apple's Maps are also a strategic component of the company's plans for iOS in the Car, slated to begin rolling out on new cars in 2014. Apple's chief executive Tim Cook called the auto initiative a "key focus" for the company.